Participating in Ham Radio contests. Participating in the Volunteer Examiner program to administer test for prospective new Ham Radio licensee. Serving as net control station (NCS) for a Ham Radio training net. 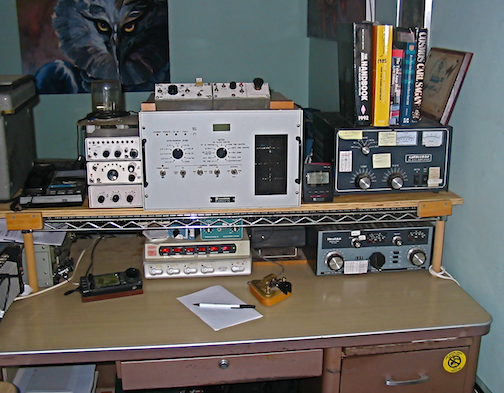 Yes, I still operate “on the air” occasionally, Mostly CW (Morse code) and mostly 20 & 40 meter bands. In addition to occasional on the air activity, I continue to dabble in the electronics associated with Ham Radio, building low-power (QRP) transceivers and various accessory circuits. Miscellaneous software for Ham Radio applications. It has been quite a ride, and I have loved every minute of it, and continue to enjoy the hobby even though other activities now require time that would have previously been used for Ham Radio activity of one sort or another. This entry was posted in Miscellaneous Musings and tagged ham radio, Radio. Bookmark the permalink. I have also been simplifying my radio operation. I guess the lousy state of the airwaves has contributed! I have far too much gear, much of it replicating what my main rig does. I am drawn to QQR and love building many of the fine kits available. Trouble is, Down Under I can bash away at the key for weeks on end (literally) and get no response, such is the sparse amateur population and large distances here. Oh well, it’s a challenge I guess much like fishing.